Welds in tubing and pipework for vacuum systems should have many important characteristics. They ideally need to be manufactured from stainless steel, leak tight, the joints should have full penetration with excellent sidewall fusion, there should be no porosity and the finish should be free from oxidation and discolouration. When welding these stainless steel tubes and pipes, it is important to purge the welding zone with an inert gas, usually argon, to prevent loss of corrosion resistance, oxidation, discolouration, metallurgical defects and to ensure a good internal weld profile. After 40 years of innovation, design and manufacturing expertise in the field of tube and pipe weld purging, Huntingdon Fusion Techniques HFT® has introduced PurgElite®, a range of low cost tube and pipe purging systems to achieve a clean, oxide free, zero colour weld in such tubes and pipes. As well as vacuum tube and piping, PurgElite can be used in any other industry where stainless steel or titanium is used. PurgElite is manufactured with a special spinal tube, joining the two dams, that is resistant to hot metal up to 300°C (572°F) and is super flexible to allow movement around 90° bends. These pipe weld purge systems are made of low outgassing rate materials, which gives them the ability to produce the right environment for high quality welds. IntaCal®, a purge gas feed device means there is no complicated valve to set. To ensure the PurgElite System can be positioned accurately inside the tube or pipe, a centre piece glow positioning indicator RootGlo® comes as standard on all sizes. HFT’s innovative PurgeGate® valve is available as an accessory, a unique one way valve suitable for all types of inflatable pipe weld purging systems. PurgeGate regulates the gas flow and pressure during welding to ensure the inflatable dams don't burst resulting in a failed weld. Heat Resistant Covers are available as accessories to protect the inflatable dams in the event that the weld process is unusually hot. 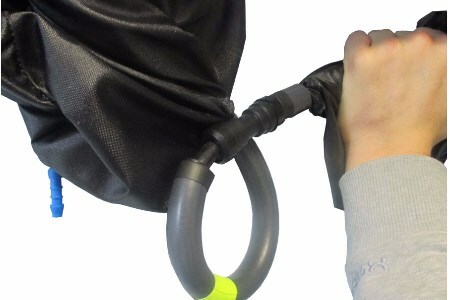 These covers suit any inflatable purging or blocking system and are held onto each dam by a number of ties. Such covers allow use up to a temperature of 300°C. There are many fabricators still using poor quality home made devices fashioned from foam, wood, metal and rubber. They are wasting vast amounts of money on expensive argon gas and labour by allowing their welders to continue in their old, often ineffective ways. By using PurgElite tube and pipe purging systems, companies can save significant money in both time and inert gas costs.